The origins of the building that hosts MCST dates back to the 1675 when Fra Giovanni Bichi, had bought a piece of land and built a Villa for his own use, after his retirement. 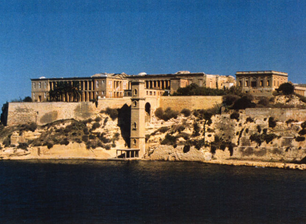 The plan of the villa was designed by the then celebrated architect Lorenzo Gafa’ of Vittoriosa. Unfortunately, Giovanni Bichi did not survive to see the place finished and the villa passed into the possession of his nephew the Knight Fra Mario Bichi. On the latter’s demise in 1712, the “garden and palace of Sso. Salvatore” was purchased by Bailiff Fra Giovanni Sigismondo Count of Schaesberg. The property again reverted to the Bichi’s in 1718 when it was occupied by another Fra Giovanni Bichi. By the time of his death in 1740, the estate had become known as Villa Bichi, later distorted to Villa Bighi. It actually appears that the first person to refer to the place as Bighi instead of Bichi was Sir Alexander Ball in 1799. When the French invaded Malta in 1798, Villa Bichi is said to have been occupied for a short while by Napoleon Bonaparte; however, there is no written evidence that the French General ever stayed there. Nonetheless, owing to the rising of the Maltese against the French and the latter’s blockade inside the fortifications of Valletta and the Three Cities, the Villa was abandoned and much of its woodwork was carried away by the insurgents. When Great Britain assumed the protection of these islands in 1800, the Villa passed into the hands of the Civil Government, the property being let out to private individuals on a yearly basis. In 1827 King George IV gave permission to the Admiralty so that a hospital could be then constructed for the fleet’s requirements and the site was taken over. On March 23rd, 1830, when Major General Fred Cavendish Ponsoby was Governor of Malta, Vice Admiral Sir P. Malcolm laid the foundation stone of the new hospital at Bighi. It is difficult to sort out with certainty who did what at Bighi but the combined efforts of Sir George Whitmore, Salvatore Xerri and Gaetano Xerri and perhaps others have produced a very pleasing ensemble which has now graced the Grand Harbour for over a century and a half. During the Second World War, the Hospital was well within the target area of the heavy bombing since it was surrounded by military establishments. A number of its buildings were damaged or destroyed, including the x-ray theatre, the East and West Wings, the Villa and the Cot Lift from the Bighi Jetty to the Hospital. In September 1970, Bighi Hospital had its doors shut for the last time. 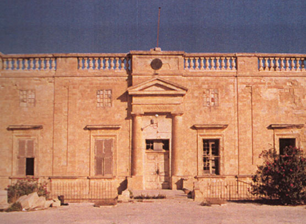 In 1977 the ex- Senglea Trade School occupied the East Wing and the Villa, while the other parts were occupied by a secondary school. In 1980 a new road complex was constructed passing from Kalkara through Villa Portelli’s gardens up through the Bighi site and down to Rinella. In 1984 the Villa was abandoned due to dangerous ceilings and the Trade School was moved to the West Wing. Other buildings in the Hospital complex, and the extensive gardens, were demolished or lost when the Housing estate to the south was built in the 1980’s. In 2010 the then government encouraged the transformation of the West Wing, Zymotic, Cot Lift, Chaplin’s House and Mental Ward into a national interaction Science Centre. Known as ESPLORA, the center is expected to open for the general public in 2016. The villa itself continues to house the offices of the Malta Council for Science and Technology since 2002.